Our team developed and rendered a concept for a new indoor practice facility for NC State University Athletics. The proposed facility would provide a full-sized regulation NCAA football practice field with end zones and four regulation sprint lanes. The brick, aluminum composite panels, and translucent wall openings complement the character of Carter-Finley Stadium and maximize natural lighting. A pre-engineered metal building framework provides over 70’ in clear height at the apex and an economical and quick installation. Wide overhead doors offer easy movement from indoors to outdoors as well as natural cross ventilation of the facility. 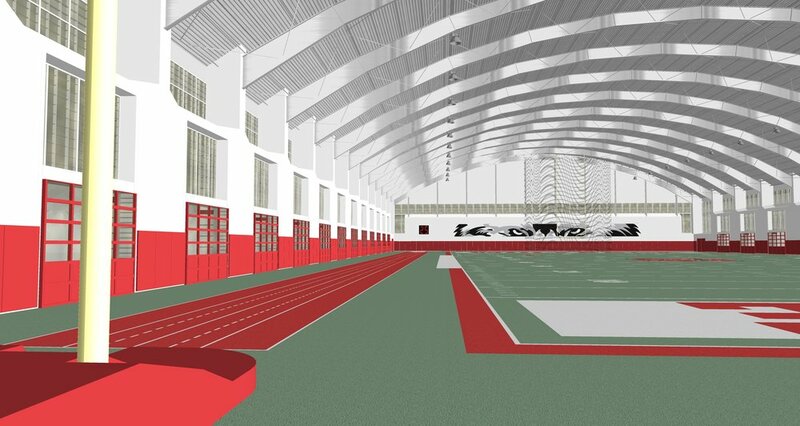 The proposed Indoor Practice Facility consists of a synthetic practice field, regulation pole vault and triple jump equipment, strength and conditioning area, and restrooms. If desired, the facility could also include additional filming stations, a training room, and storage.